Swimming pool etiquette (also known as lap swimming etiquette) is a set of informal rules of conduct that ensure a smooth swimming experience when several swimmers share a lane. Swimming pool etiquette allows smooth swimming in crowded lanes. As a new (lap) swimmer you are often unaware of the existence of a swimming pool etiquette. Nevertheless, over time you’ll notice that the more experienced swimmers follow specific informal rules when they share a lane. So if you want to appear as a well-mannered swimmer and get along with other swimmers, it is important to get educated about lap swimming etiquette too. 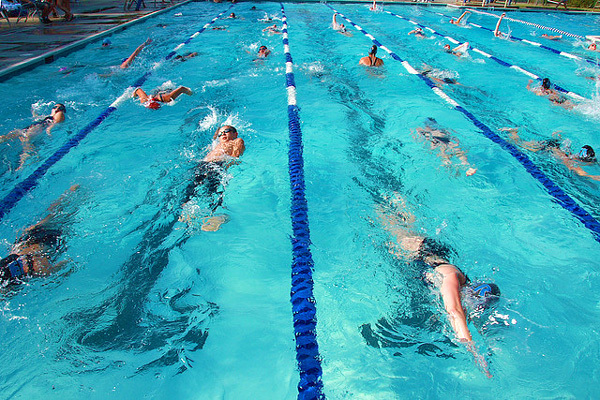 Gauge the speeds of each lane and join the lane where the swimmers swim at your pace. This is because it is distracting for experienced swimmers to have to pass slower swimmers constantly. If you are alone in a lane, you can swim following the middle line. If there are two swimmers in the lane, it can be split into halves, and each swimmer swims on his side of the lane. Or the swimmers use the “circle” format described hereafter. If there are more than two swimmers in the lane, they should circle in the lane. This is most often done by swimming counterclockwise. When joining a lane, slowly enter the water and wait on the side during one lap until all swimmers have noticed that you will join the lane. If you are the second swimmer to join a lane, discuss with the other one how you will share the lane. Don’t dive into the lane from the starting blocks when you join a lane. This can be distracting or even frightening for swimmers who are concentrated on swimming their laps and don’t know what is happening. Normally, diving from the starting blocks should only be done during practice under the supervision of a coach and when lap swimmers don’t use the lane. If you want to pass a slower swimmer, tap him on the foot so that he knows your intention. He will then stop at the end of the lane and move to the right corner so that you can pass. Do the same if you are the person being passed. Don’t push off the wall right in front of a faster swimmer, especially if he’s going to do a flip turn. Let him/her pass first. Likewise, don’t push off right behind a slower swimmer to directly pass him by. Leave him some room before pushing off. Some swimmers, often breaststrokers, swim stubbornly in a straight line and never make way to other swimmers. However, it is more challenging for front crawl or backstroke swimmers to see other swimmers. So make way and swim around other swimmers if possible. If you chat with a fellow swimmer, do it on the sides of the lane to not obstruct the lane end for the lap swimmers. Do the same if you need to rest. Don’t cross the pool right in front of a swimmer. Don’t use a whole lane for walking, aqua jogging or some random exercise when the pool is busy. Don’t “borrow” a piece of swimming equipment that you haven’t brought yourself and seems abandoned. It may well be needed by one of your fellow swimmers very soon. 1. No diving without proper supervision. 2. If you are not following the rules and going to the diving board without adult and proper supervision, you may be removed from these premises. How hot can an indoor pool area get before you have to close it?